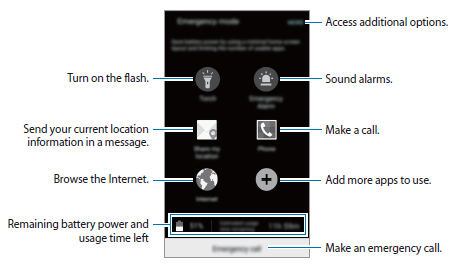 The Samsung Galaxy S5 Neo (SM-G903F) user manual consist of 104 pages. This manual provide detail reference information such as about phone part overview on page 8, tutorial Installing the battery on page 10, Installing the SIM or USIM card on ppage 15, Installing a memory card and Formatting the memory card on page 18. Then in this manual you can also find important information about using touchscreen, home screen and lock screen, Device and data management on page 39, Updating the device on page 41, Backing up and restoring data on page 42, Performing a data reset on page 43, Installing or uninstalling apps, Creating contacts manually, using internet, email, camera, Smart Manager, s health, Voice Recorder, google apps and more. Further about phone settings guide like Connecting to a Wi-Fi network, Pairing with other Bluetooth devices, Flight mode, Mobile hotspot and tethering, Using the NFC feature, safety, troubleshooting and more.